Published: Nov. 18, 2010 at 06:17 p.m. There's a reason for everything in the NFL. Sometimes coaches make decisions based on hard data, and at other times, football myths. But this much is sure: The myth about running backs hitting the wall at 30 is true. The facts about 30-year-old backs make the New York Jets' signing, utilizing, and subsequent scaling back of LaDanian Tomlinson both practical and puzzling. First, the puzzling part. The 2009 Jets made it to the AFC Championship Game largely because they played solid defense, had an effective running game ... and got a little help from Curtis Painter. The ground attack was not only effective, but led the NFL with a staggering 172.3 yards per game. Thomas Jones was a major factor, rushing for a career-high 1,402 yards despite being a 30-something, a dinosaur at the running back position by league standards. But in the offseason, Jones was cut, only to be replaced by 31-year-old LaDainian Tomlinson. 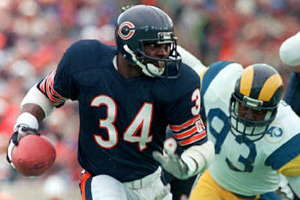 Walter Payton is one of six backs in NFL history to rush for more than 1,000 yards after turning 32. Much of it had to do with a $3 million roster bonus Jones was due. The Jets didn't want to pay it, nor did they want to foot the bill for his $2.8 million salary. That's where practicality came into play; LT is only costing them $2.5 million total this season. Yet, the fact that Jones is also a year older than Tomlinson matters. When backs become 30-somethings, every year counts. Tomlinson might have more than 3,000 carries to his name, but age notwithstanding, he's been very productive this season. And Rex Ryan wants to make sure LT stays effective. So how does a coaching staff do that? Limit carries and platoon. The latter means run Shonn Greene. The former means you're not going to see Tomlinson receive more than 20 carries in a game much, if at all. In fact, he has only one game in which he toted the rock 20 times (20 carries vs. the Vikings in Week 5). Ryan and offensive coordinator Brian Schottenheimer know they'll need Tomlinson when the weather gets colder and they're playing 17-14 games in December. 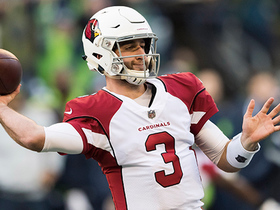 Ryan wants to run the ball and play defense, and he needs his veteran lead back to be healthy and fresh. Limiting carries does not scientifically prove to keep an NFL running back fresh. In fact, many league observers felt that John Riggins was better after he hit his 20th carry, wearing defenders down in the fourth quarter. Then again, Riggins was a freak and could probably grind out 3 yards right now in between Youtube video taping in the woods. Riggins aside, what the numbers do tell us, and ultimately warn the Jets about LT, is that running backs truly hit a wall at 30. NFL analysts have been talking about it for years in the context that all of us aren't the athlete we'd like to be at 30 -- pulling hamstrings while doing a little weeding in the backyard. But close analysis of the best running backs of all time shows the decline at 30 to be much more than a random theory; it's a flat-out fact. In order to see exactly what Tomlinson might be in store for, I pulled the TI-81 graphing calculator out of retirement and examined the top 25 rushers of all time, guys who were productive after turning the age where everything starts sagging. Larry Johnson was released by the Redskins before he even turned 30 (Nov. 19). But in Johnson's case, the question was as much about want-to as it was declining skills, whereas the list of the NFL's all-time leading rushers is chock-full of guys who played hard for a decade or more in the NFL. Whether it's the pounding of so many carries, the lack of desire, or the loss of a step, these great players didn't have to turn 33 or 34 to decline rapidly. The top rushers in NFL history gained nearly half a yard more per carry, while averaging 23 yards more per game, before 30. Number of carries has often been a concern among head coaches, as well as a statistic that fans can wrap their arms around. Yet, high rush attempts don't consistently reflect a decline in production. Look no further than Jones and Tomlinson for proof. Despite having a whopping 600 more career carries than Jones, Tomlinson is averaging more yards per attempt (4.7 to 4.1) this season. More proof: Johnson has only 1,426 career rushing attempts, and apparently has already flamed out. Riggins was just getting started at 1,400 carries. Emmitt Smith had his best season a year after crossing over the 1,400-carry barrier, when he put up 1,773 yards and 25 touchdowns in 1995. Ditto for Barry Sanders, who gained 1,883 yards the season after he ran for the 1,400th time. While the question of carries is debatable, age is not. Some running backs, including Ricky Watters, Curtis Martin, Tony Dorsett, Fred Taylor, and Walter Payton, managed to have strong seasons the year they turned 31. The list gets really small at 32 (see chart). Of the 527 times a running back has gained 1,000 yards in a season, it's only been done eight times by a back who was 32 or older. Make no mistake, the decline after 30 is rapid. Nearly half the players in the top 25 never gained 1,000 yards in a season after passing their twenties -- and these are the best running backs the NFL has to offer in its 91-year existence. Imagine if we looked at the top 50 or top 100. Back to Tomlinson, the seventh all-time leading rusher (soon to be sixth). In signing him to a two-year deal, the Jets are hoping the 31-year-old can be productive in 2011 when he's 32. But with his un-guaranteed contract as well as a potential lockout, they don't have to exactly stress over it; Ryan can just ride that horse this year only. LT's lighter workload gives GM Mike Tannenbaum quality over quantity for the money he shelled out last spring. From a team standpoint, perhaps the two-back system will enable LT to run wild come playoff time in January. For Tomlinson's career, the shared duties might enable him to be one of the few backs to be productive with his 30th birthday getting more distant in the rearview mirror.